My boyfriend is the hardest person to shop for. Buying gifts is often difficult and this year for his birthday I decided to skip the torture of trying to shop and just take him out of town for a surprise adventure. After our successful purchase of a Groupon vacation deal, I tried it again and got a fantastic price on an oceanfront room at the beach. The last trip to the beach was for our anniversary last year and sadly, I’d gotten food poisoning and couldn’t enjoy it. I told Michael to pack typical Oregon clothing and we hit the road Saturday morning after I went to the gym (and he went for a bike ride). The destination: Newport Beach. We arrived to a rather gray welcoming but it wasn’t too cold and it wasn’t raining, so I was happy. We stayed at the Best Western Agate Inn right on the beach. The deal I bought included a “picnic” basket with two wine glasses, a bottle opener, an insulated bag, a wine topper and a bottle of wine. 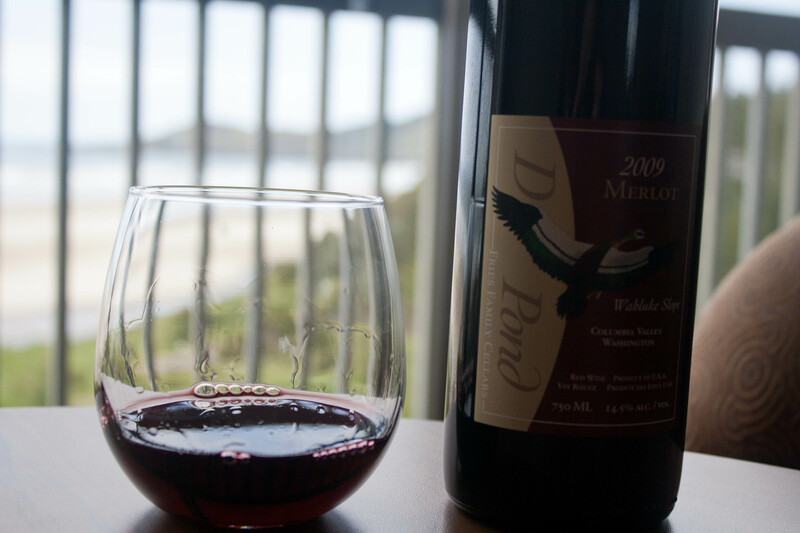 We immediately opened the wine and enjoyed a leisurely glass before heading down to the beach for a walk. 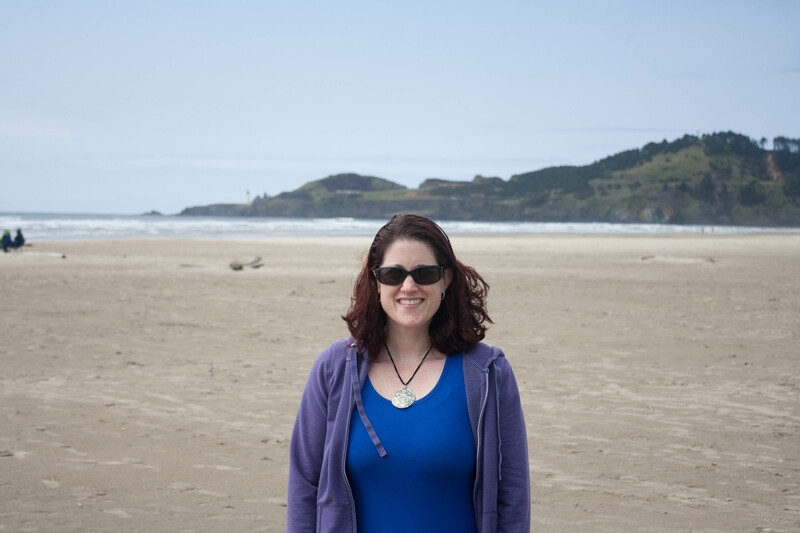 Agate Beach was really nice, quiet and smaller than some of the other Oregon Coast beaches. Sadly, I did not find any agates. We walked back to the hotel and then decided to go into Newport in the “old town” area. It was a touristy boardwalk with piers that had views of the massive bridge. 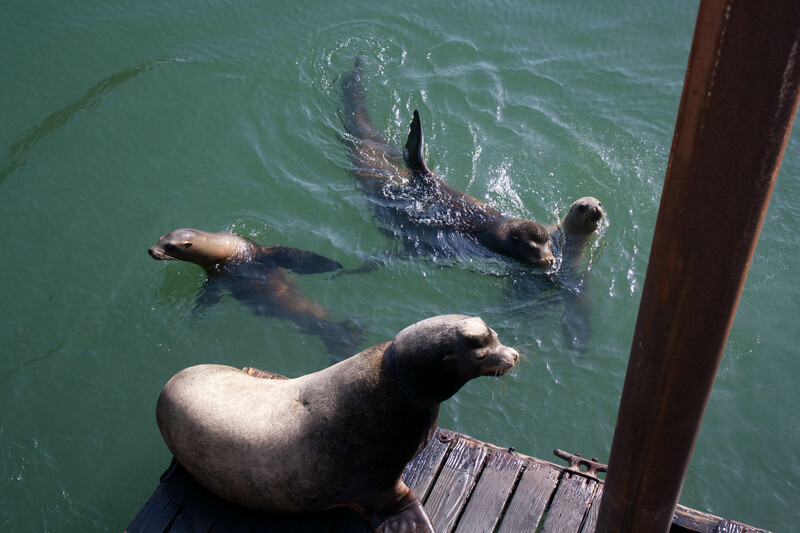 We did some window shopping and then got totally sidetracked by the California Sea Lions that were giving quite the show in the water. 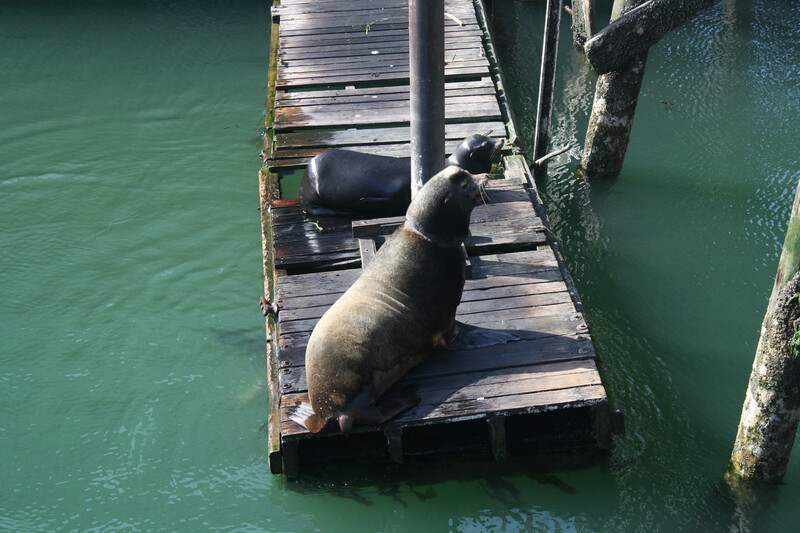 There was a group of them lounging in the sun on a wood platform. One of them looked like it weighed about 800 pounds–he was an old one. There were a few other big ones, not as big as him, and then some smallers one that were playing in the water. 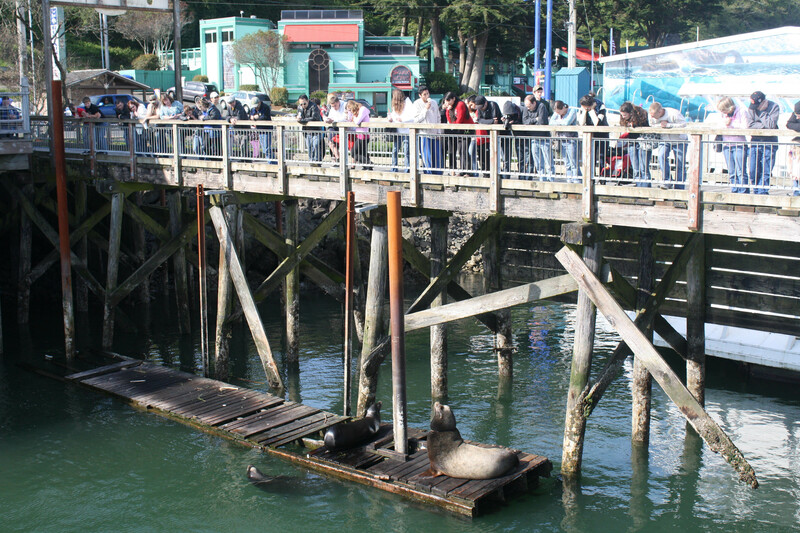 The little Sea Lions gave everyone a show, and the big ones bellowed their bark that echoed throughout the downtown area. Crowds were forming to watch the free show. 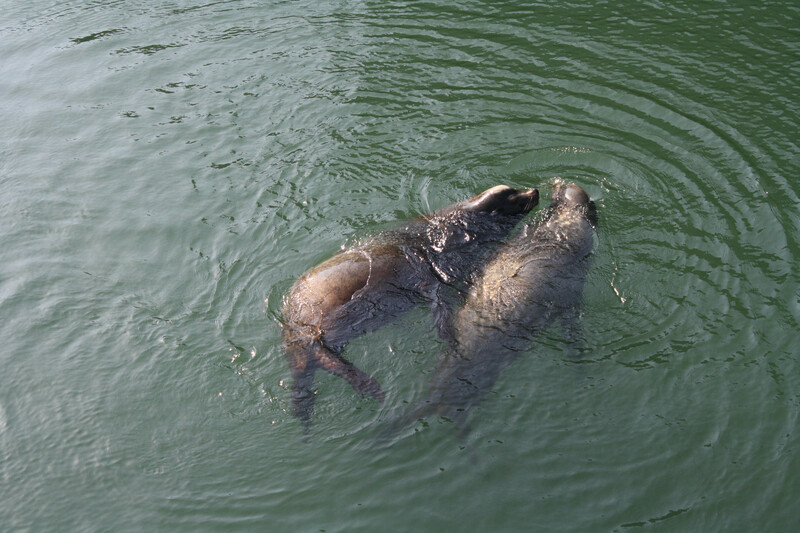 I have to admit, the Sea Lions were probably my favorite part of the weekend. They were so cute and playful. The little one was frolicking, splashing, doing acrobatics and then would kiss one of the other lions. What beautiful and graceful creatures. 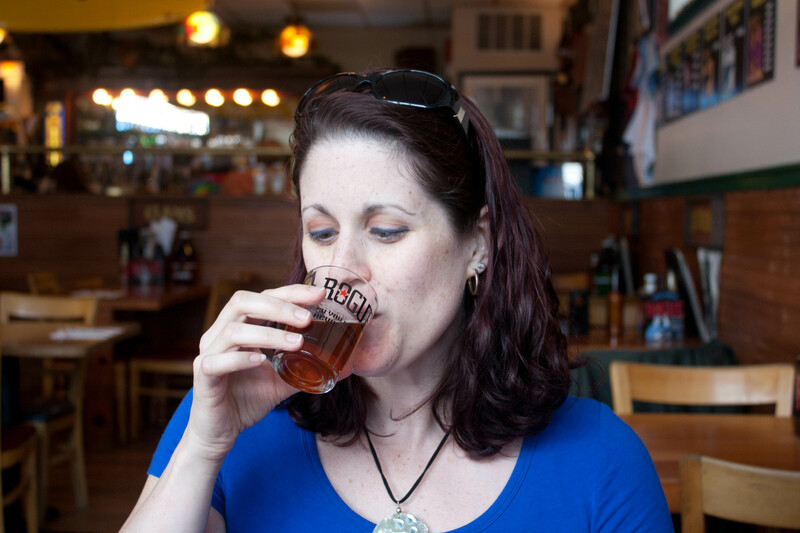 After the sea lion show, we headed up the street to the Rogue Brewery for dinner. It was one of the destinations I had planned for the weekend and I’m glad we were able to go. 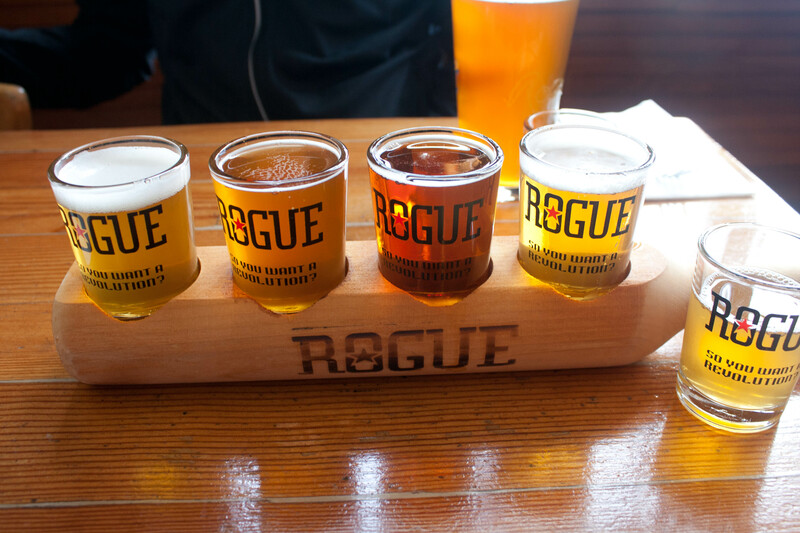 I can’t say that I am familiar with the Rogue beers, but after my tasting on Saturday night, I love them! Morimoto Pilsner: it was summery and light, like lavender perfume. Chipotle Ale: smokey finish. We both loved this one. It did not taste like peppers. I want to find bottles of this one. Damn, it was good. Juniper Pale Ale: smelled like a lemon, smooth, nothing very distinctive about it. Brutal IPA: tasted like orange, smooth finish, not bitter. Double Dead Guy: tasted like alcohol, candy and had a slight coffee finish to it. New Crusty Triple IPA: syrupy and very hoppy. Michael and I decided to split a few things for dinner. 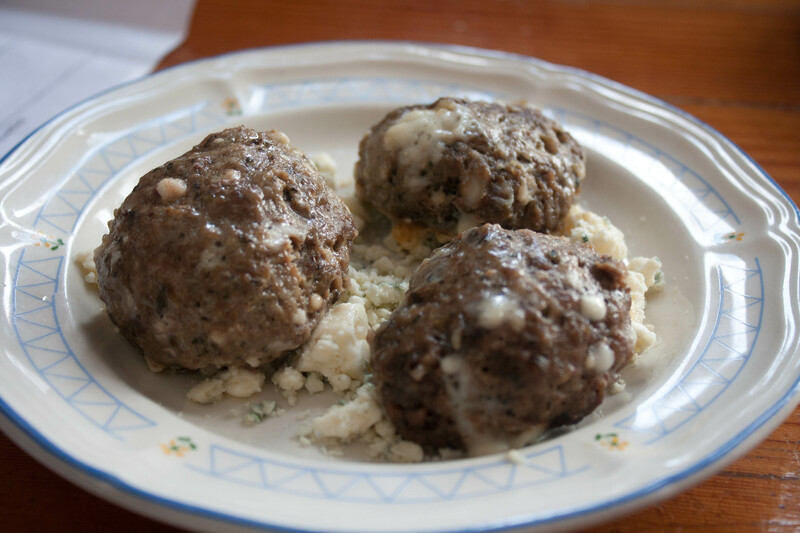 The first was the “bleu balls”– three meatballs made of a local, organic beef with blue cheese baked inside the meatballs and then scattered around the plate. The blue cheese went perfectly with it. I had 1.5 meatballs (kind of the perfect amount). Next was the halibut fish and chips. We split that, thankfully. It was pretty big. We each had 1.5 of the fillet and shared the fries. 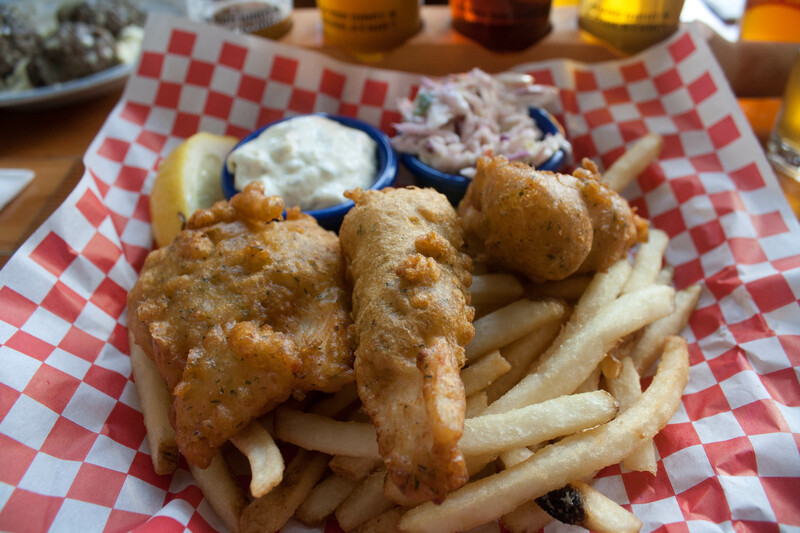 I have fish n’ chips about once or twice a year–and usually at the beach. It’s not something I crave very frequently and giving in annually is about right for me. 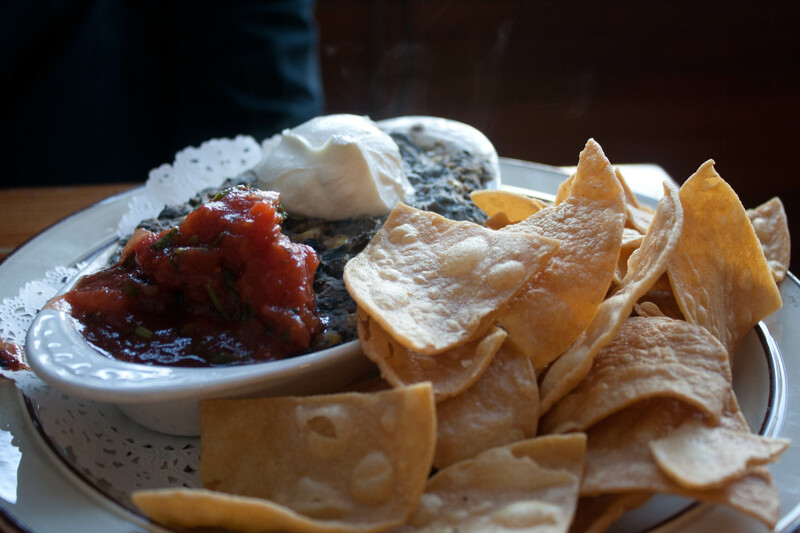 Michael was still hungry, so he ordered the black bean dip with freshly made tortilla chips. I munched on a little bit of it but I was pretty full after the dinner and the beer. Okay. It wasn’t really hiking. 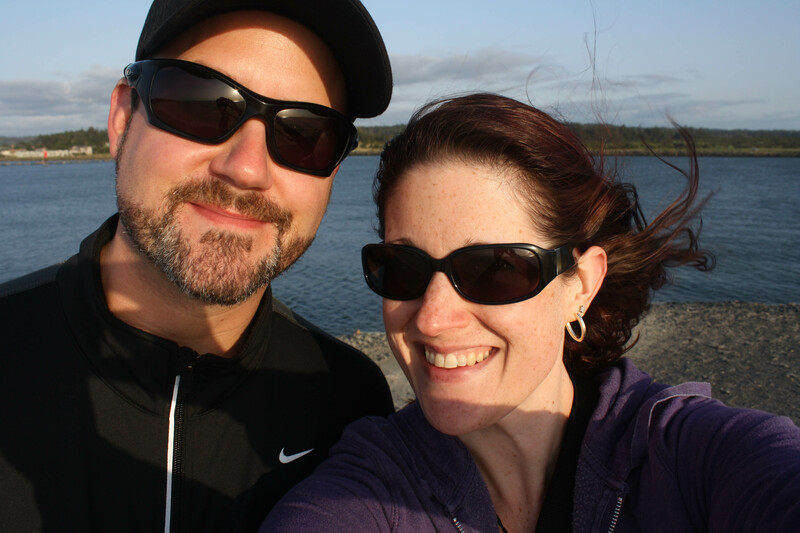 We went to the lighthouse park on the hill not far from downtown Newport, and then walked down the trail to the beach. There was a trail through the trees and brush, and then stairs down to the beach. I admit, my legs were screaming at me after working out that morning and already walking on the beach! We walked out toward the jetty. 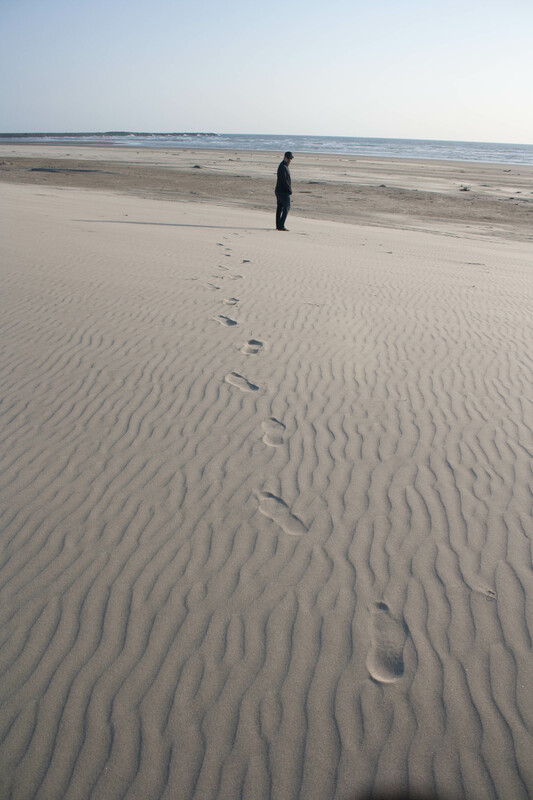 That particular beach was almost like Mars–quiet, empty except for us, with big sand dunes. It was also really windy. Michael and I didn’t make it very far. Walking for about 20 minutes or so, then getting to the jetty to find it gated off, we turned around and headed back up the beach to the stairs. It was a really nice evening, romantic and busy at the same time, and I fell asleep to the deafening sound of the ocean waves rolling into the shore. I truly think that if I listened to a CD of roaring waves every night, I’d never suffer from insomnia. 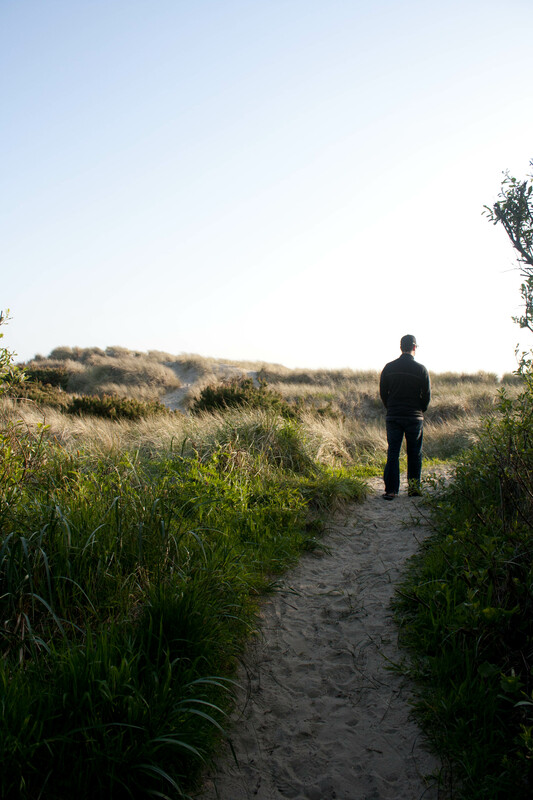 QUESTION: What is your favorite beach activity? I love Newport! I used to visit a few times a year when I lived in Albany. We visited all the places you mentioned minus the beer tasting (I wasn’t of age at the time). 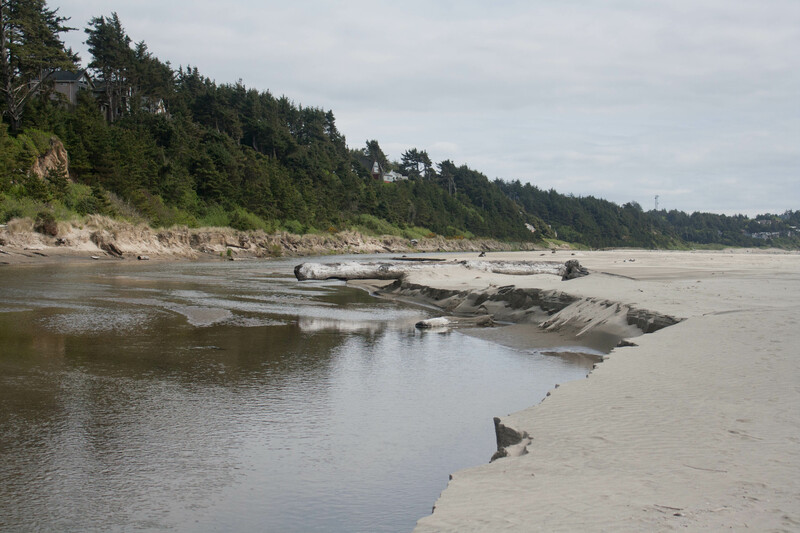 Have you found agates on Agate Beach before? I’m not as familiar with Newport. 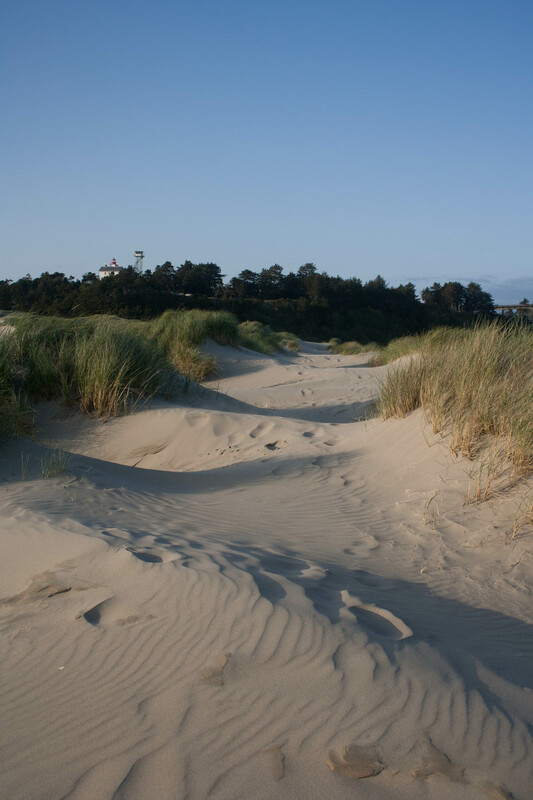 As a kid we always went to Rockaway and Tillamook, and then as an adult I usually went to Lincoln City or Seaside. Newport was a nice change. 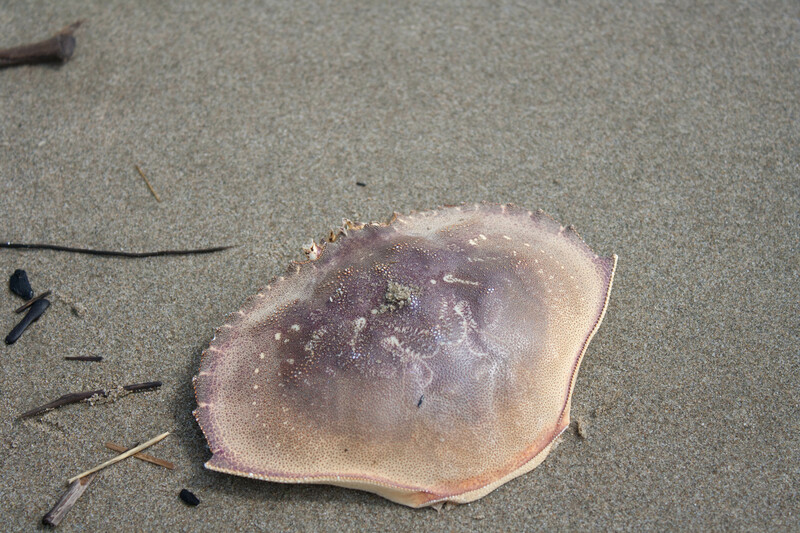 Nope, never found an agate on the beach there before. Yesterday was my husband’s 39th birthday & he got 39 beers. He was quite happy with it! Just an idea that I thought might work for you in the future! That is a really cute idea! What kind of beers did he get? I love Newport! my grandparents, aunt and uncle lived there, so I spent many holidays, spring breaks and weekends there. 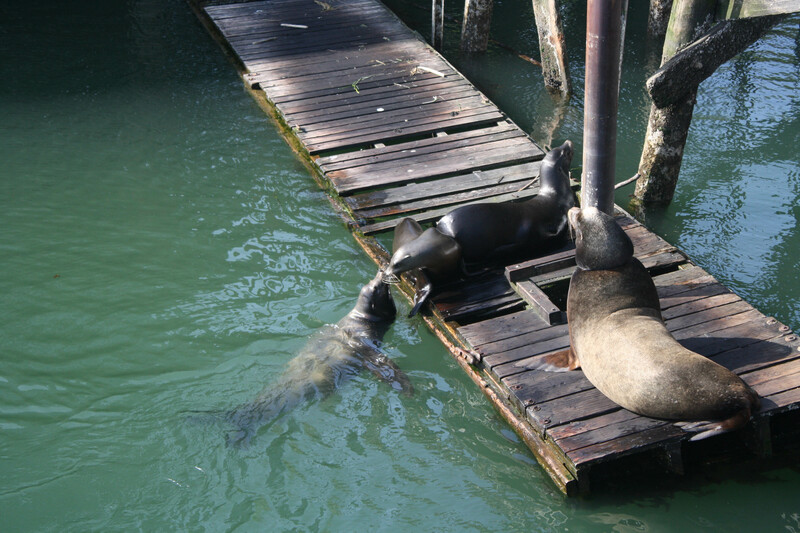 Rogue is definitely a must visit, and the front street where you saw the sea lions is one of my favorite places… I could spend a whole afternoon walking around there. Did you know there is a Rogue in town? In the Pearl, on NW 13th + Flanders. my friend Mikey works there, if you ever go in tell him “Krismas Snow” says hi. 😉 yeah… old name from way back. if you liked the beers and food the Portland Rogue is a fun place. Awesome! I did not know there was Rogue here. I will check it out! Hi Lisa. Oh wow….what a fantastic getaway. Happy Birthday to Michael. 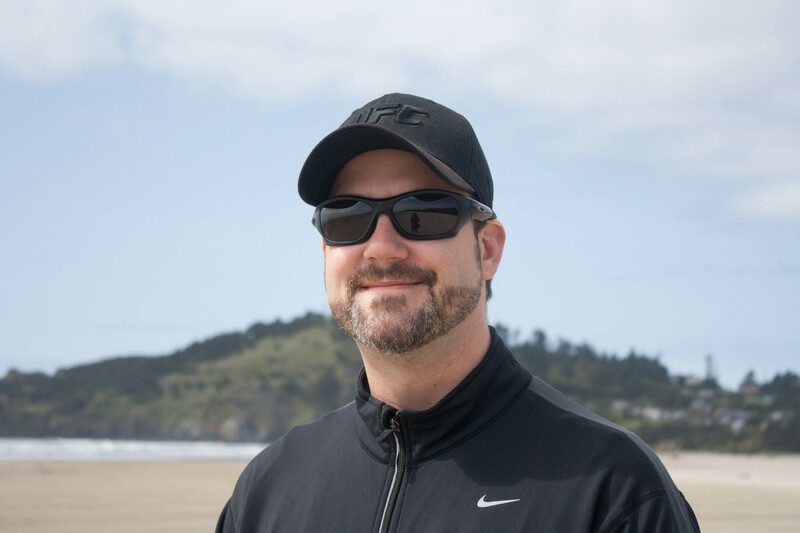 Roz@weightingfor50 recently posted..In this post, I will NOT…. I saw some bonfires on the beach Saturday night and I REALLY wanted to do that! Next time. Thanks for the shout out – glad to see you could make a stop at our Brewery and Headquarters in Newport. 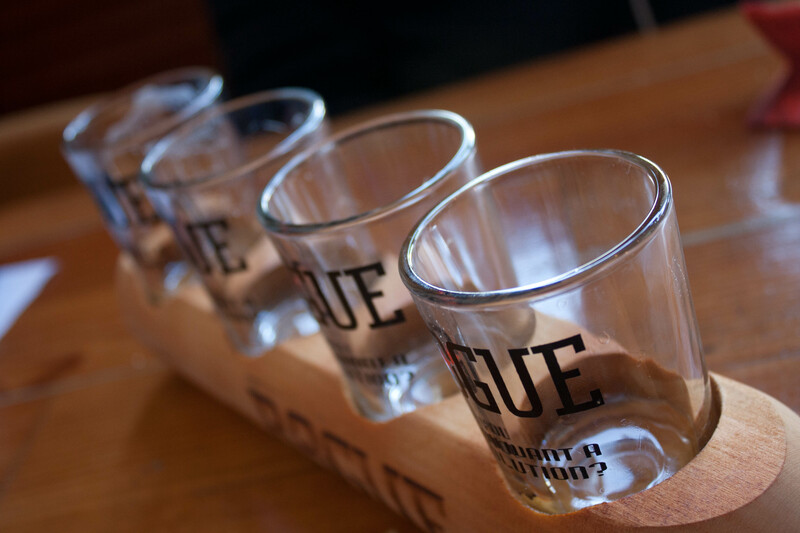 Look forward to having you at one of our locations again soon (www.rogue.com/locations/locations.php). Rock n Rogue! Thanks for commenting! I will most definitely be checking out your other pubs. I hear there is one in the Pearl District and I want to try that soon. Good job on the beers. We haven’t been in but we went to the BBQ street fest out in the street by it last summer and drank their beer. Super fun! That’s right across the street from the Cascade Brew pub. I’ll have to check it out.